GAPP Architects and Urban Designers were appointed by the City of Cape Town to plan and oversee the rehabilitation, restoration and adaptive re-use of the Granary building in Buitenkant Street, Cape Town. This complex of buildings, is of high cultural, social architectural and historic significance. 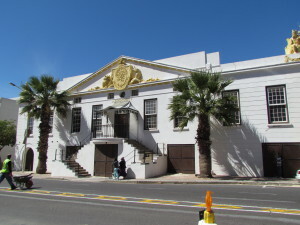 The proposed use of the building as a museum, archives and offices by the prospective tenant, The Desmond and Leah Tutu Legacy Foundation, is considered highly appropriate, given the site’s historic associations. The design approach for the proposed development closely follows the heritage design informants previously identified by Graham Jacobs in an earlier report. It is based on a ‘Building-as-document’ approach where the irregular historical layering will be reserved as part of the narrative, while adding a new contemporary layer of fabric, reflecting the proposed new use of the building in future, specifically in reference to the important role the proposed tenants played in the history of South Africa. The proposed interventions are mainly internal and consist of repairs and renovations. New building fabric will clearly be expressed as contemporary in order to separate its appearance from the original fabric. Some later buildings are demolished to achieve a legible footprint as a basis for the design and planning for the adaptive re-use of the building. Kobus is an Associate at GAPP Architects and Urban Designers and has been with the company as an Architect since May 2002. In addition to his other tasks he is responsible for the Heritage Consultancy of GAPP Architect previously headed by David van den Heever. In this capacity he has been involved in heritage studies related to Urban Design done by GAPP. The focus of his post graduate studies in urban conservation was research on the impact of the ever shifting power space relationship as it is reflected in the historic development of the urban environment and the implications on the redevelopment of urban space. Currently he is leading a process of assessing the condition, compliance and heritage status of the full range of provincial immovable assets of over 8million m² for Western Cape Provincial Government. This portfolio consists of around 1500 schools, 320 health facilities and 70 general buildings. The brief is to address shortcomings in the present asset management process, develop life-cycle maintenance policies and to recommend and test improved systems for assessing and managing the assets throughout the Province. In his professional capacity he is increasingly focusing on a holistic approach to the optimisation of existing buildings applying his wide knowledge of heritage, energy efficiency and asset management.